Welcome to the Open Hearts Balanced Scorecard. This is the strategy map that drives our organization. It is founded on our mission, vision and values to guide the development of short and long-term strategic initiatives. The Balanced Scorecard is highly valued due to its comprehensive model which helps organizations focus their strategic direction in each of the following four perspectives: Organizational Capacity, Business Process, Financial Stewardship and Client Service. Open Hearts uses this as a guide to review strategic activities and opportunities, while aligning them within the four strategic themes: Community Impact, Dynamic Services, Innovative Growth, and Valued Partnerships. We focus our efforts in order to achieve optimal results in these key areas. 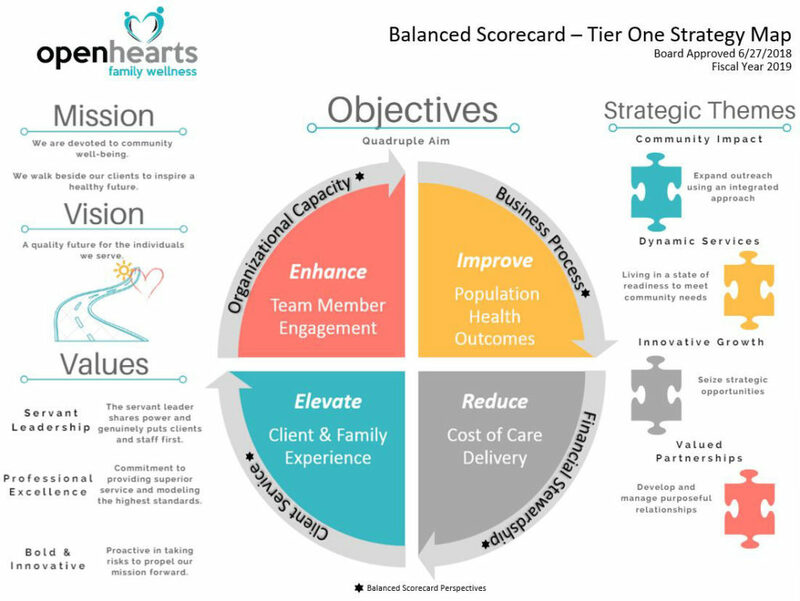 Open Hearts’ Fiscal Year 2019 Balanced Scorecard Objectives are focused on the four major areas known as the “Quadruple Aim”, a widely accepted compass to optimize healthcare performance. These four areas: Enhance Team Member Engagement, Improve Population Health Outcomes, Elevate Client & Family Experience, and Reduce Cost of Care Delivery, are recognized in health care as being the major drivers to improve quality of healthcare across entire populations. The Balanced Scorecard strategy and Quadruple Aim are a compass that points to better care, better health and lower costs.